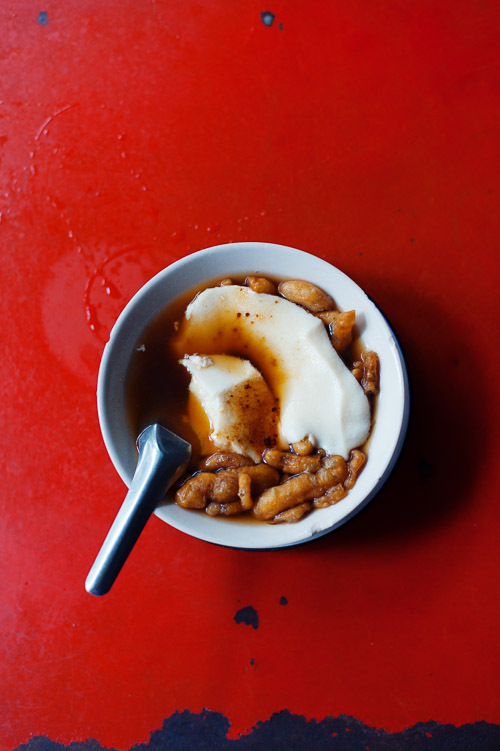 It's heating up in Bangkok, and when this happens Thais have traditionally reached out to two very different sweet snacks of Chinese origin in an effort to cool down. Tao huay (เต้าฮวยน้ำขิง), pictured above, is a unique combination of thin slices of a type of very soft bean curd pudding and a hot, spicy, ginger broth. The dish is garnished with crispy deep-fried bits of dough and a dash of raw cane sugar (น้ำตาลทรายแดง). Hot, spicy broth may seem a counter-intuitive snack choice in sweltering weather, but Chinese belief entails that eating hot, spicy things induces sweating, which ultimately cools one down. 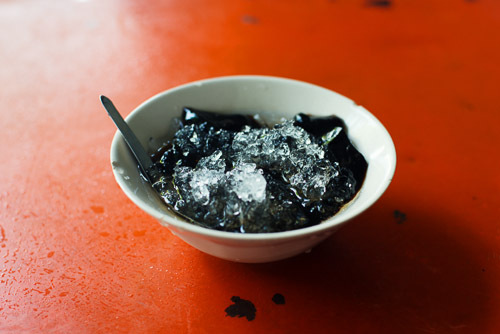 In Thailand, the stuff is served with crushed ice and sprinkling of raw, fragrant cane sugar. The ice is an obvious cooling element, but in Chinese medicine, grass jelly is thought to inherently possess cooling properties, pushing the body's balance towards the yin end of the spectrum. 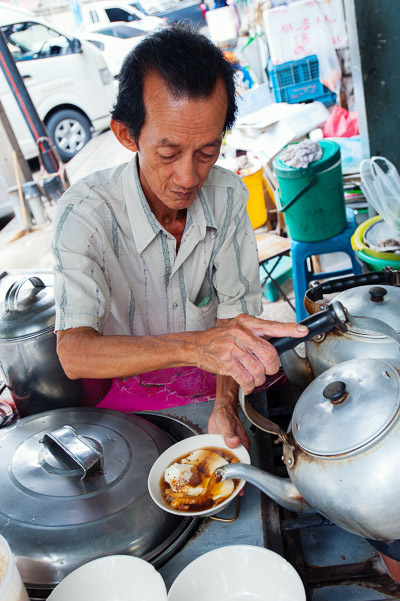 where this vendor has been working the kettles for more than 50 years. He doesn't make the ingredients himself, but they're of good quality nonetheless.